Edviges Isabel Felizardo Coelho holds a degree in Economics, a master’s degree in Statistics and Information Management, and a Ph.D. in Information Management from Universidade Nova de Lisboa. 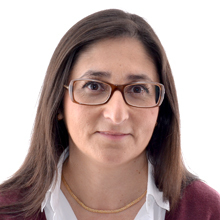 She is an Associate Professor at the School of Economic Sciences and Organizations at Lusófona University. She is a Senior Technical Specialist in Statistics at the National Statistics Institute, in the area of demography. She does her research in the area of life expectancy, namely in the estimation and prediction of mortality in Portugal. Areas of Academic and Scientific Interest: Prediction models and methods, especially in applications to demography: models of projection of mortality and life expectancy, mortality tables.